At the second stage of the Vuelta a Espana in San Fernando Nacer Bouhanni (FDJ.fr) claimed the first road stage win. John Degenkolb (Giant-Shimano) crossed the line in second with Roberto Ferrari (Lampre-Merida) taking the final podium spot. 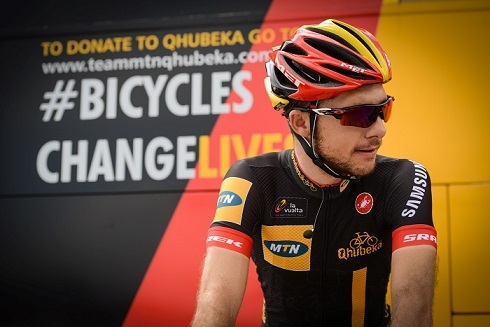 Team MTN-Qhubeka had Gerald Ciolek finishing in 11th place. The first breakaway of this year’s event contained no less than two MTN-Qhubeka riders. Jacques Janse van Rensburg and Kristian Sbaragli both got into the early move that formed on the opening cat three climb of the day, this was the team plan all along for these two riders and so it was positive to tick off another box early on in the race. In the sprint at the top, Nathan Haas (Garmin-Sharp) just pipped our Sbaragli for the honours. After the summit Janse van Rensburg pressed on with three other escapees and was clearly the stronger of the quartet made up by Valerio Conti (Lampre – Merida), Romain Hardy (Cofidis) and Javier Armendia (Caja-Rural). After leading the race for 150km’s, he was the last rider to get caught.